Bhopal: As many as 94% government schools in Madhya Pradesh do not have electricity, 96% do not have benches for the students and 77% do not even have water in toilets. This has been found in a ground level survey by NGO Child Rights and You (CRY). It has also been found that though 92% schools have toilets, 49% are not in usable condition or are not used. This survey was conducted in 190 schools across 13 districts and was released on the eve of Children’s Day (November 14). These schools (141 primary and 42 secondary) cater to 14, 983 children – of which 7153 are boys and 7786 girls. The survey also shows that none of the schools have toilet cleaning staff. Benches: 183 out of 190 schools did not have benches for students to sit on. 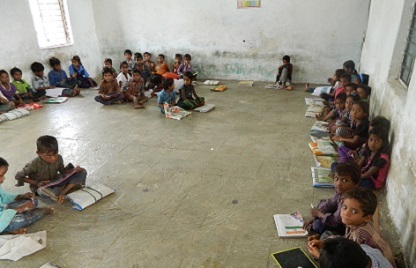 Majority of the children sit on rugs and mats while some sit on the floor. Soha Moitra, CRY Regional Director- North, says, “Not only is the state grappling with poor school infrastructure there is also a huge shortage of teachers. Education is not simply a preparation for the future but an investment on our children in the present". "It is therefore the duty of the state government to ensure that all the gaps in the system are addressed and the RTE act is effectively implemented”, she said. Even the recent Annual Status of Education Report (ASER) report 2006-2014 points to a sharp decrease in the ability of children in the state to read and understand their subjects. Only 11% class 3 students could do subtraction in 2014 as against 61% in 2007. The number of class 5 students who could read English words dropped from 58% in 2007 to 25% in 2014. Similarly only 18% class 7 students could read English sentences in 2014, a drop from 64% respectively in 2007.